Note: For those who come to my blog only for the usual Torah commentary and Jewish musings, there are none in this post. Here is where I get to fulfill my fantasy of being what I would love to be if I wasn't a rabbi--a rock critic. If you want a sense of what it was like to hear Bob Dylan in his prime, don't go to a Bob Dylan concert. Instead, run out and catch a show by the young Swedish singer-songwriter Kristian Mattson, who performs as The Tallest Man on Earth. Anyone who knows me is well-aware that I am a Bob Dylan fanatic, so I do not make this statement casually. Although, by a not-so-simple twist of fate, I was born too late to see Dylan at his best--in one of his amazing incarnations as an early 60s folk hero, mid-60s visionary rocker, or, my personal favorite, the broken-hearted bard of 1975's Blood on the Tracks--I have nonetheless been lucky enough to have caught him many times live since the late 1970s, when he could still put on a memorable show. But those days are gone. Always brilliant at making the most of what he's got, Dylan now dons the mask of the weary, hard-bitten road warrior. He fits the part. Yet with his voice burned down to an atonal froggy rasp, I find him virtually unlistenable in concert, an almost-camp parody of his legendary self. But tonight, I got an inkling of how I imagine it must have felt to hear Bob at the Gaslight in the Greenwich Village of 1962, at the infamous "Royal Albert Hall" show of 1966, or on his 1974 comeback tour with The Band. This is not to say that The Tallest Man on Earth stands eye to eye with Bob Dylan, who is one of the greatest artists of any genre in the 20th century (this would be a tall order even for the TMOE, who is not really all that tall). 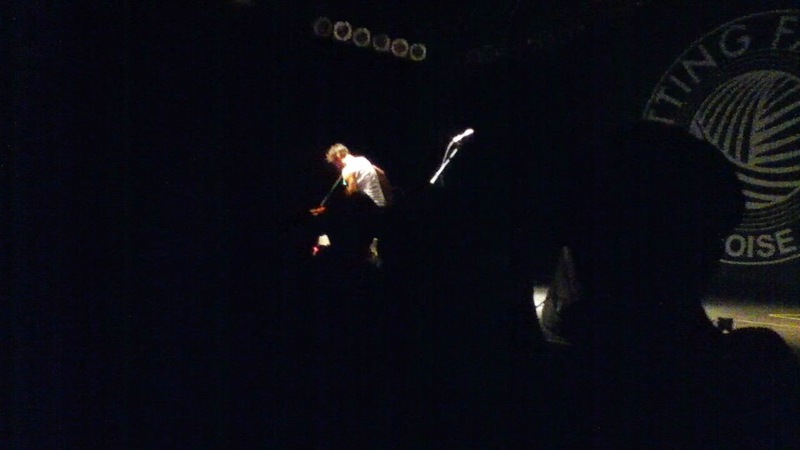 But Kristian Mattson does provide a taste of that kind of musical glory. He is an extraordinary singer-songwriter, and an amazing guitar player. His stage presence is electric, and he shares Dylan's calling as a troubador, singing of loss and anger and pain and joy and, above all, vision and longing. The Tallest Man on Earth also shares many of Dylan's sensibilities. This is no surprise, for Mattson grew up listening to Dylan records, to which he pays homage in songs like "King of Spain" where he dreams of boots of Spanish leather. And as a Swede, he shares Dylan's roots in the North Country--further north, even, than Hibbing, Minnesota. Those roots contribute to their shared starkness of vision and paradoxical surreal clarity. It is also worth noting that Mattson's wife, fellow Swedish singer-songwriter Amanda Bergman, performs under the name Idiot Wind (perhaps the most epic song on Blood on the Tracks). But TMOE is also very much his own man and his own artist. He fuses Dylan's legacy and influence with his own creativity--just as Dylan himself once did with the music of his own idol, Woody Guthrie. To hear The Tallest Man on Earth is to hear both old and new, tradition and innovation. I found that combination thrilling and enthralling. I will never stop listening to Bob Dylan. He is my undisputed musical master; if my life has a soundtrack, it is made up mostly of Dylan songs. But sometimes the spirit of what is old lives on most strongly and faithfully in something new. Those of us who are well into middle age need young artists to continue the legacy, to keep things fresh and revive what we loved in our youth. I don't ever want to keep my dial glued to the oldies stations, wallowing in nostalgia. Musical traditions--like all traditions--must be reinvigorated with every passing generation. Without new blood, new interpretations, new visions--faithful, but not in blind service, to the old--the music dies. I learned this lesson anew, joyously, tonight. One cannot live a Jewish life alone. Ours is a communal tradition. Many primary Jewish activities require a minyan—the presence of ten adults (in Orthodox Judaism, only men; in liberal Judaism, both women and men). Without a congregation of ten, we do not read Torah in public, celebrate the blessings over a marriage, or recite the mourner’s Kaddish. Surprisingly, the source of this practice of minyan comes from this week’s Torah portion, Shelach L’chah. In the reading, Moses sends twelve scouts, one per tribe, to spy out the land of Canaan. Two of them—Joshua and Caleb—urge the people to enter the land. But the other ten scouts bring back a negative report, complaining that the people who live there are too strong for the Israelites to conquer. In response to that group of naysayers, God asks Moses: “How much longer shall that wicked congregation (edah) keep muttering against me?” From this language, the Rabbis of the Talmud derive the teaching that ten people constitute a congregation (tractate Megillah 23b). How ironic: the requirement for a minyan comes from one of the most infamous and negative gatherings in the Hebrew Bible! Why do the Rabbis use this case? They could just as easily have cited God’s concession to Abraham to save Sodom for the sake of ten righteous individuals. Another source, in the midrash, argues for the minyan as corresponding to Jacob’s ten sons who go down to Egypt in search of food during time of famine. Yet the final ruling insists on the ten fearful and rebellious scouts as the source of the practice. This is particularly true here at CABI. We are a relatively small community, and we cannot rely on others to keep Jewish life vital. It is up to each and every one of us to do our part. We need not be saints to make the minyan—thank God. He was, of course, wrong. Americans love second acts. Consider this: The Great Gatsby was the number two movie at the box office this week—and Baz Luhrmann’s current production is the fourth film version of Fitzgerald’s classic 1925 novel. Our culture, high and low, is practically defined by second acts, from Thomas Jefferson (who lost the presidential election of 1796 to John Adams, then came back to defeat him in 1800) to Kim Kardashian. Second acts are even more important in the Jewish world. Why? Because our tradition recognizes that since we fail so frequently, life without second chances would be impossible. Teshuvah—the opportunity to learn from our mistakes, make amends, and move forward—is at the very heart of Judaism. When we sin at the Golden Calf, Moses smashes the tablets of the commandments—then goes back up and returns forty days later with a second set. The ensuing period of wandering in the wilderness is the story of our constant backsliding and failure. We complain and transgress and sorely try the patience of both God and Moses. But though they both get angry, neither ever really gives up on our ability to grow and, given a second (or third or fourth) chance, do better. As Kushner goes on to note, no one need feel permanently exiled or lost. The wicked child of the haggadah can, with a concerted effort, become the wise. This week, let us be thankful for the second chances that we receive, and generous in affording them to others. We are thankful for the opportunity to gather for the first time in this newly renovated meeting place. In ancient days, the judges of the Sanhedrin in Jerusalem would convene in a hallowed hall known as the Chamber of Hewn Stone. My Jewish tradition teaches that this was a sacred place, for wherever our leaders gather to hear and honor the voice of the people, to legislate and govern, with wisdom, fairness, and compassion—in such a place, sacredness always dwells. We pray that this refurbished chamber will live up to that legacy, and be always a source of pride to the citizens of Boise and those whom we choose to represent us. We ask blessing for them, and for our beloved city. Eternal One, grant them the vision to guide our future, the patience to secure it, and abundant compassion for all whose destinies will be shaped in part by the decisions that they render. Help them to hear the voices of all whom they serve. Remind them—remind us all—that the true measure of any community lies in the way it treats its most vulnerable members. And may we all be blessed, as we re-dedicate this space, by a citizenry with a shared vision, in which people of all races, orientations and creeds are united in a common bond: to banish bigotry, and to establish justice for all. May they go from strength to strength. As Belinda Carlisle famously sang back in 1987, heaven is—or at least can be—a place on earth. In this week’s Torah portion, Naso, Moses erects the mishkan, the sanctuary-tent that the Israelites carry through the desert: “On the day that the Tabernacle was set up, the Cloud covered it. . . . In the evening, it rested over the Tabernacle in the likeness of a fire until morning.” Cloud by day, pillar of fire by night—the Divine Presence, as it were, dwells among the people. Indeed, Jewish tradition teaches, when Moses brought the community together to construct the mishkan, he metaphorically wed heaven and earth. The Midrash Pesikta de Rav Kahana notes that in the beginning, God dwelt among us. A series of transgressions, beginning with Adam and Eve in Eden, caused the Divine Presence to withdraw. But a series of righteous acts, ending with Moses’ work on the Tabernacle, invited the Holy One to return. Heaven is in the sages—and in us, when we live by their sacred legacy. On Tuesday night, we will celebrate Shavuot, z’man matan Torahteynu, the time of the giving of the Torah. May we be ready for, and worthy of, this ever-new and remarkable gift. And may we follow its map to heaven—right here on earth.